Welcome to our website of St. Johns Lutheran Church. What you will find on the web site are the times you can worship with us, study the Bible, how to become a member, what we do to serve others, and events that are happening at St. Johns. More than information if you come and visit us you will find that we take seriously the condition of the soul as a life and death matter. We want everyone to be saved because that is the will of our Father in heaven. We want all to hear the “Good News” that Jesus loves you and has done everything necessary for you to live with him forever. For many years we provided good Christian education but costs prohibited us to continue to do so. 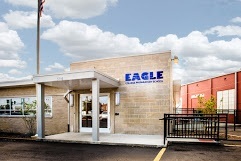 We have reopened our doors with Eagle College Prep School. We have partnered with Open Sky Education to offer high quality elementary education and a before and after school program that offers each child learning in a loving Christian environment within our community of Tower Grove South. I hope you are finding what you are looking for. If you don’t let us know so we can better serve you.